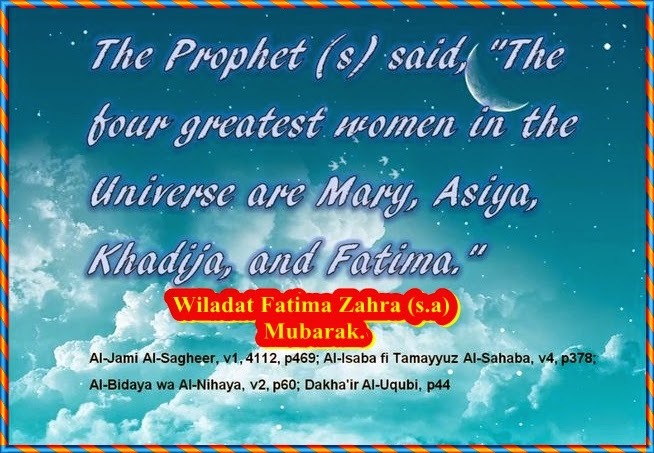 As reported by Abu Jaˋfar Qummi, her names include: Fatima, Batul, Hassaan, Hurrah, Sayyidah, ˋAdhra, Zahra, Hawra’, Mubarakah, Tahirah, Zakiyyah, Radhiyah, Mardhiyyah, Muhaddithah, Maryam al-Kubra, Siddiqah-ye Kubra8; and in the heavens she is called Nuriyyah and Haniyyah.9 It should be noted however, that by her names, we generally mean her titles and qualities. She was not necessarily called by all these names; some of them were her titles, while others reveal her qualities, and this is why they are more or fewer found in different traditions. Anas bin Malik narrates: “The Messenger of God (S) asked us, “What is most preferable for women?” We did not know what to reply, so ˋAli went to Fatima and asked her this question. “It is as if I see that the day of judgement has come, and I can see my daughter F¡§ima seated on a radiant mount. She is surrounded on all four sides by 70,000 angels, while she leads the believing women of my community (ummah) into paradise. Every woman who would pray five times a day, fast in the month of Ramadhan, go for pilgrimage to the house of God, pay alms out of her wealth, and obey her husband will enter paradise by the intercession of my daughter, Fatima. Bihar al-anwar, vol. 43, p. 172. Shaykh al-Kulayni; ‘Usul al-Kafi, 2/355. Shaykh ‘Azizallah Atardi; Musnad Fatima Zahra, hereafter called Musnad, quoting from al-Tarikh of Ya’qubi. Musnad, p. 219 quoting from Muruj al-Dhahab. Musnad, p. 14, quoting from Mustadrak al-Sahihain. Hassaan means devout and chaste; Hurrah means a free woman; Sayyidah means a leader of other women; ˋAdhra means pure; Radhiyah means a women who has reached the state of contentment; Mardhiyyah means a women who God is pleased with; Haniyah means a women who is abundantly kind-hearted and forgiving. Musnad; p 28, quoting from Manaqib of ibn Shahr al-Ashub. Musnad; p 30, tradition 31, quoting from Kashf al-Ghamma of Arbali. Musnad; p 30, tradition 29, quoting from Kashf al-Ghamma of Arbali. Musnad; p 32, tradition 34, quoting from Sunan Tirmidhi. Musnad; p 33, tradition 35, quoting from Mustadrak al-Sahihayn of Hakim Nishaburi. Musnad; p 14, tradition 1, quoting from Dalail al-Imama of Abu Jafar Tabarr. Musnad; p 34, tradition 37, quoting from Mustadrak al-Sahihain. Musnad; p 529, tradition 4, quoting from al-Manaqib of Ibn Maghazali. Musnad; p 336, tradition 9, narrated by Hafiz abu Naim in Hilyatu’l awliya’. Musnad; p 336, tradition 10, quoting from al-Manaqib of Ibn Maghazali. Bihar al-anwar, vol. 43, p. 134. Musnad; p 147, tradition 7, quoting from Iqab al-Amaal.